In a move bound to shake up the camper trailer market, Jayco has launched a tent trailer range. Known as JTRAK, the camper comes in four forward-fold variants: Touring, Touring X, Outback and Outback X. The weights start at 950kg Tare (Touring), with the top off the range Outback X tipping the scales at 1400kg Tare. JTRAK also heralds the release of the second iteration of Jayco’s own JTech independent suspension system. 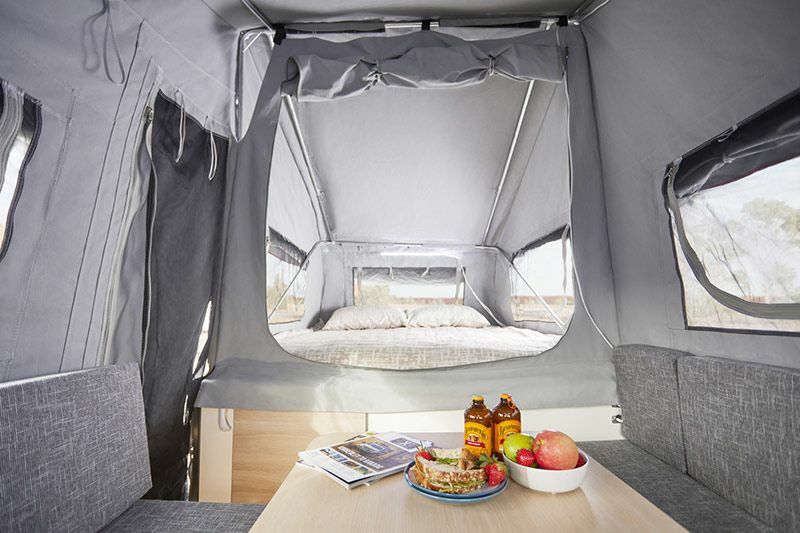 Each models sleep up to four people, with a double bed and a dinette area that converts into a second bed. A slide-out kitchen contains a three-burner cooktop with flame failure device, stainless steel sink, storage space, a removable shelf and LED light. There are two bayonets underneath for gas, along with a nearby 12V socket. “Combine the JTech 2.0 suspension with the compact nature of a tent trailer, and we see JTRAK appealing to those wanting to put the tinny on the roof and head off to find those secret fishing spots and venture off the beaten track,” Jayco research and development manager Neil McGowan said. He said JTRAK underwent “rigorous testing”, included laboratory tests and “real-life testing on the same ground where major automotive and truck manufacturers, and suppliers to the Australian Defence Force test their vehicles, and JTRAK passed with flying colours”. Next articleReview: Viscount Caravans is Back!